XML, XSLT and the new wave of web services with SOAP. Using PHP with Macromedia Flash. 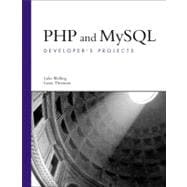 PHP and MySQL in the wireless world. Building a search engine with PHP. Using RSS and XML to transfer information between sites. If you are a serious web developer who is already familiar with the basics of PHP and MySQL, you will be able to take your skills to new heights with PHP and MySQL Web Development. Luke Welling and Laura Thomson, authors of PHP and MySQL Web Development and MySQL Tutorial, are partners in Tangled Web Design, an award-winning web development firm that specializes in developing dynamic Web sites using PHP. Thomson is a lecturer at RMIT University in Melbourne, Australia is completing her Ph.D. in Adaptive Web Sites. Welling is a senior web developer at MySQL AB. He previously worked as a lecturer in the School of Computer Science and Information Technology at RMIT University in Melbourne, Australia.